Vida Dutton Scudder was born on December 15, 1861, the child of Congregationalist missionaries in India. In the 1870s, Vida and her mother were conﬁrmed in the Episcopal Church by Bishop Phillips Brooks. After studying English literature at Smith College and Oxford University, Scudder began teaching at Wellesley College. Her love of scholarship was matched by her social conscience and deep spirituality. 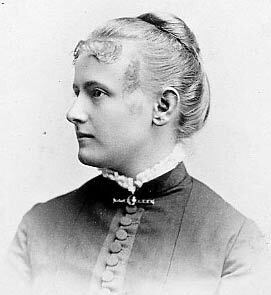 As a young woman, Scudder founded the College Settlements Association, joined the Society of Christian Socialists, and began her lifelong association with the Society of the Companions of the Holy Cross in 1889, a community living in the world and devoted to intercessory prayer. In 1893, Scudder took a leave of absence from Wellesley to work with Helena Stuart Dudley to found Denison House in Boston. Stresses from teaching and her activism led to a breakdown in 1901. After two years’ recuperation in Italy, she returned renewed and became even more active in church and socialist groups; she started a group for Italian immigrants at Denison House and took an active part in organizing the Women’s Trade Union League. In 1911, Scudder founded the Episcopal Church Socialist League, and formally joined the Socialist party. Her support of the Lawrence, Massachusetts, textile workers’ strike in 1912 drew a great deal of criticism and threatened her teaching position. Though she initially supported World War I, she joined the Fellowship of Reconciliation in 1923, and by the 1930s was a ﬁrm paciﬁst. Throughout her life Scudder’s primary relationships and support network were women. After retirement, she authored 16 books on religious and political subjects, combining her intense activism with an equally vibrant spirituality. “If prayer is the deep secret creative force that Jesus tells us it is, we should be very busy with it,” she wrote characteristically, adding that there was one sure way “of directly helping on the Kingdom of God. That way is prayer. 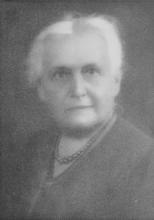 Social intercession may be the mightiest force in the world.” Vida Scudder died on October 9, 1954. I Most gracious God, who didst send thy beloved Son to preach peace to those who are far off and to those who are near: Raise up in thy Church witnesses who, after the example of thy servant Vida Dutton Scudder, stand ﬁrm in proclaiming the power of the Gospel of Jesus Christ, who liveth and reigneth with thee and the Holy Spirit, one God, now and for ever. Amen. II Most gracious God, who sent your beloved Son to preach peace to those who are far off and to those who are near: Raise up in thy Church witnesses who, after the example of thy servant Vida Dutton Scudder, stand ﬁrm in proclaiming the power of the Gospel of Jesus Christ, who lives and reigns with you and the Holy Spirit, one God, now and for ever. Amen. I admire her very much, and am glad she’s on the calendar. But please expand a bit. “She founded Denison House.” OK, what was that? The article mentions one group that later met there, but doesn’t say what Denison House was intended to accomplish. If it’s a significant ministry, please identify it! If not, why mention it? New New Testament reading: This choice seems to fit the commemoration well. She died on October 9. Now that the “one day, one commemoration” rule has changed, should hers be moved to October 9? In line 10 of the first paragraph, move “in 1889” to the beginning of the sentence, so that the description of the Companions of the Holy Cross follows immediately after the name. The clumsy “to work….to found” construction in lines 1 & 2 of the second paragraph can be avoided by substituting “in founding” for “to found”. She needs a ‘Who she is” and “Why she is important” statement. The new New Testament reading seems to fit the commemoration. This collect struck me as a bit labored. The phrase ‘who sent your beloved Son to preach peace to those who are far off and to those who are near’ seems to have been chosen for its sonority rather than its applicability; in its NT context it uses the term ‘peace’ only in passing as it makes the point that the gospel is for Gentiles as well as Jews. Surely ‘blessed are the peace-makers’ has a much more direct application to Scudder’s life and could be used in the same way. The phrase ‘after the example’ doesn’t seem good contemporary English; ‘following the example’ would be better, but why not simply ‘like your servant’? To be like her in following the example of Christ is presumably the goal. Finally, ‘stand ﬁrm in proclaiming the power of the Gospel’ doesn’t seem to hit the right note either. I only know about her what I read in the bio, but ‘proclaiming’ seems like a word we would use for a preacher or an evangelist rather than an educator and witness for peace. I would say something like ‘witness for the peace of the gospel of your Son’. If you wanted a more rhetorical tone, you could use James 3.18 and say ‘labor for the harvest of righteousness, sown in peace by those who make peace’. I love this commemoration. It deserves to be included. The suggestions already submitted sound good. I don’t have any particular additions to make about the bio or the collects, myself. Using just the bio and collect at Noonday Prayer, I don’t have comments about the readings or preface, either. There seems to be much overlap between Miss Vida Dutton Scudder (October 10) and the Rev. William Dwight Porter Bliss whose commemoration is proposed for October 8th. Miss Scudder is already commemorated in the calendar. I am not at all sure what the additional commemoration of the Rev. William Dwight Porter Bliss adds to a calendar which is fast filling up. I am delighted that Vida Dutton Scudder is being included in the calendar. I am not entirely unbiased, as I am presently the Senior Associate for Christian Formation at Trinity Church, Copley Square, where Ms. Scudder was formed as an Episcopalian by blessed Phillips Brooks. One necessary correction, however, to the profile of Ms. Scudder. It says that Ms. Scudder and her mother were confirmed by Bishop Brooks in the 1870’s. This would have been impossible, as Brooks did not become the Bishop of Massachusetts until 1891. I suspect the more accurate way to put it would be to say that Ms. Scudder and her mother were prepared for confirmation by Phillips Brooks, then Rector of Trinity Chuch, Copley Square, Boston, and later Bishop of Massachusetts. William W. Rich, Senior Associate Rector for Christian Formation, Trinity Church, Copley Square, Boston. The four things I appreciate most about the life and ministry of Vida Dutton Scudder are: 1) she was not only a follower of Christ, but was often Christ-like in her activism, 2) she was a scholar-activist, 3) she had a breakdown mid-life that she had to recover from in order to continue her ministry, and 4) though she was at odds with the dominant culture, she lived her life with passion and integrity. How about some public acknowledgement of her sexuality? It would be great to highlight the work of gay persons in the earlier life of the church.